The lowly shipping container, globalization's pack mule, is doing far more than transport duty these days. The mundane module has inspired a whole school of construction, pioneered by, among others, American artist-architect Adam Kalkin. Since he first created a dwelling with one in 1999, he has developed Quik House, a three-bedroom kit house fabricated from recycled containers, and most recently the Push Button House, a single container that opens in 90 seconds at the touch of a button. Italian coffee company Illy uses some as mobile outdoor cafés in Chicago, California and South America. British development company Urban Space Management put in its bid for gritty glamor with Container City, a warren of 15 artists' studios fashioned from 20 recycled containers in London's Docklands district in 2001. The crated community proved so popular, it was expanded to 40 units a year later. Since then, Urban Space has constructed 27 other buildings from recycled containers around the U.K., including classrooms, a health center and a recording studio. But container construction is getting even bigger. In the west London suburb of Uxbridge, a 120-room Travelodge hotel is being built out of 87 steel crates, stacked and snapped together Lego-like, into two nine-story towers. When construction is finished in March (the hotel opens in June), its radical construction technology will be hidden behind a more orthodox brick and concrete exterior. 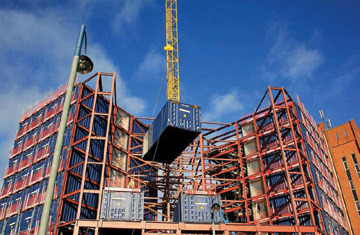 Created by London's Verbus Systems, the building boxes, 50% wider than standard cargo containers, are pre-fitted with bathrooms, wiring and plasterboard walls, so they require only a minimum of finishing work; the technique is proving to be 25% faster and 10% cheaper than traditional construction methods. But Verbus says the savings could be much bigger. The Uxbridge hotel wasn't originally designed for modular construction. Had it been, construction time could have been halved and costs chopped by as much as 40%. "The economics are compelling," says Verbus company director Paul Rollett. "This is a step change in how to do these things." Travelodge certainly thinks so  it has okayed construction of a second, 307-room container-built hotel near Heathrow Airport for later this year.